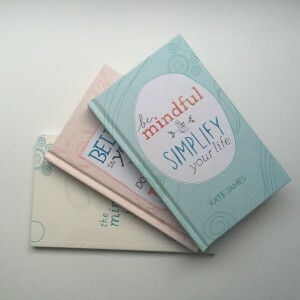 Kate James is a mindfulness coach and the bestselling author of Believe in Yourself and Do What You Love (2015), Be Mindful and Simplify Your Life (2016) and The Mindful Journal (2016). Kate recently came into the Affirm Press office to run a session for our staff on how to practise mindfulness in the workplace. Initially it was hard to allow ourselves the time out from a busy and stressful print deadline day but afterwards we found ourselves calmly walking back to our desks and, despite the interruption from a busy day, we got the books to print and left the office on time. It was a great reminder of the benefits of mindfulness, both personally but also in a team culture. This week we caught up with Kate to get a few more insights into success and happiness. You had been thriving as a mindfulness coach for some time before you met Martin and decided to write a book. 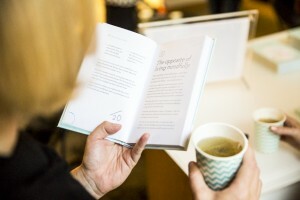 Was there anything in particular that you wanted to achieve through your book that differed from the goals of your one-on-one and group sessions? I was hoping that the book would be a way to reach a much wider audience and make mindfulness feel less daunting and more accessible. And I think we’ve managed to achieve that! As Martin pointed out recently, both of my books have been a hugely collaborative effort. I think the whole Affirm team have had some input and this has made the books so much more than what they would have been had they just been projects I had worked on alone. In Be Mindful and Simplify Your Life, you say that “… living mindfully is learning to value ‘being’ as much as you value ‘doing’.” Could you expand on that quote? In Western culture, we’re taught from a very young age to be focused on outcomes, goals and achievements. Many of us feel like there’s something wrong with slowing down or stopping for even five minutes during the course of an average day. For the most part, we just keep ‘doing’ stuff. When we place the same importance on ‘being’, we’re not only honouring the need to slow down and be still but we’re also able to see that as individuals, we are worthy of value because of who we are, not because of what we achieve. Mindfulness has become increasingly popular in recent years but perhaps some use it as a band-aid solution to stress rather than a lifetime practice and philosophy. Would you agree? I do agree with this and I heard someone say recently that mindfulness has become a business rather than a practice. I think there’s an element of truth in both of these statements but only if that’s the way we use mindfulness. From a personal perspective, I’ve been meditating for 23 years and it’s a key part of my life, so it’s definitely not a quick fix for me. Having said that, there’s research that confirms a mindfulness practice can have a powerful impact in just eight weeks, so the truth is, it actually can be used as a short-term fix. In a way, I don’t think it matters if this is how you use it. As long as it helps, it’s okay. Are there some common mistakes people make early on in their mindfulness education that if avoided might lead to better long-term success? Probably the most significant mistake people make is placing a lot of pressure on themselves when they start practising. They feel like they’re getting it wrong if they’re not being fully mindful (i.e. not distracted) but one of the key aspects of the experience of mindfulness is simply to notice that distractions occur and not getting too caught up in them. The gift of this is that we can then take this philosophy out into the world – when we find ourselves experiencing any kind of unpleasantness or difficulty in life, we can do our best to observe what’s going on with a friendly, open approach, rather than getting too caught up in the drama. If you had to sum up your personal philosophy in just a few sentences, what would you say? What I care about most is living a purposeful life. For me this means being true to myself, even if the choices I make don’t necessarily look impressive to the outside world. I do my best to live in alignment with my values and to do work that allows me to use my natural strengths. My family relationships and friendships really matter to me but, equally, I value time on my own and now that I’m older I’m comfortable to express that. Something else I’ve discovered more recently is that I need to spend time in nature to stay grounded and to feel at peace. Could you please share your top three tips for keeping a healthy balance between your work and home life? It’s a constant balancing act! I take care of my health by meditating daily, doing yoga a few mornings a week, walking and eating pretty well. I have one coffee a day and I still drink wine – you don’t need to give those things up to practise mindfulness (thankfully!). I love my work so I’m a classic ‘over-committer’. If I’ve spent a week feeling stretched time-wise, I try to be more realistic about what I take on. I’m constantly checking in and noticing if I feel energised and happy with the way my day or week is going. If not, I try to change something.